Quality Education Making a Difference! Illinois has the ability to revitalize the economy through its' resources. The people in Illinois have above average percentage of people earning a Bachelor or higher 31.9% than the United States 29.3%. Illinois is fortunate to have many outstanding higher education and should further look into incentives to keep graduates working at businesses that have or will locate to Illinois. North Central Illinois businesses benefit from a skilled and dependable recognized for a strong Midwestern work ethic. Illinois workers are among the most productive in the world. More than 46 percent have gained education beyond the high school level, and Illinois worker productivity exceeds the national average by $1.18 per hour. Much of this leadership can be attributed to Illinois' long-standing commitment to helping prepare its workforce in the skills needed for jobs with a future. A variety of Illinois programs are geared toward meeting the specific and unique needs of Illinois employers, as well as individuals. The region is served by Streamlined, cost-effective programs to help Illinois workers keep their skills constant with changing technologies and business processes. Businesses benefit through increased productivity, reduced costs, improved quality and competitiveness. 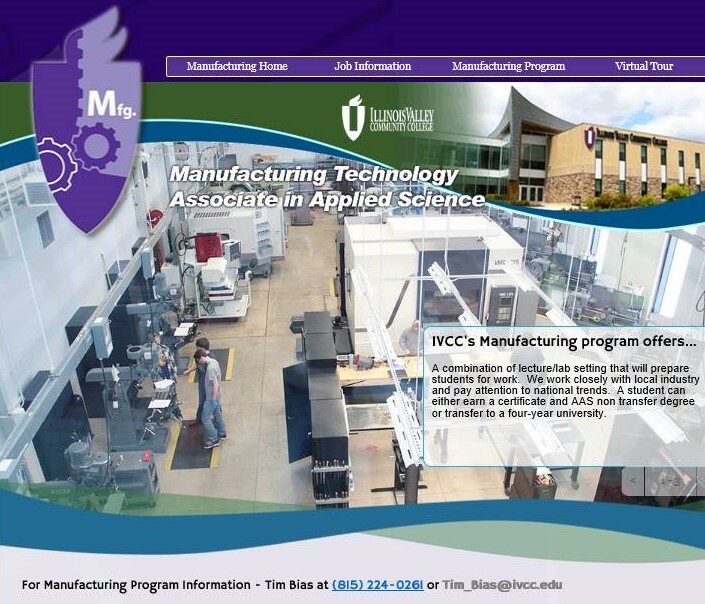 The Illinois Valley Community College Business Training Center provides training and services to businesses, and cooperate with other local economic development entities to help attract and retain commerce and industry. These centers provide a wide variety of job training and economic development activities, including customized job training for businesses, entrepreneurship training, and job training for unemployed individuals. Local schools, regional vocational centers, community colleges and universities also offer a wide array of vocational and technical training programs to assist Illinois workers in obtaining the skills they need to help businesses grow and prosper. For more information click here or call (815) 224-0645. New and existing employers in North Central Illinois have tremendous opportunities for low-cost industrial training programs. Depending on training requirements and employer needs, some programs may be available at no cost to the employer. The Economic Development Corporation of North Central Illinois works closely with employers to take advantage of the cost-effective employee-training programs that best suit company requirements. Programs can be customized to meet individual company needs. The Industrial Maintenance and Electrician Certificates can be earned through a combination of classroom learning and hands on learning with the latest classroom and industrial technology. The students are working in the classroom with highly qualified instructors, who have many years of experience and they continue working to bring current field experience to the classroom. The Manufacturing Technology Associate can be earned through a combination of lecture/lab setting that will prepare students for work. The bridge between manufacturing and engineering. Graduates use a combination of theory and “hands on” approach to complete tasks as needed by manufactures to improve quality and productivity. The instructors work closely with local industry and pay attention to national trends. A student can either earn a certificate and AAS non transfer degree or transfer to a four-year university. We offer a state of the facility with modern equipment. Instructors have multiple years of industry and academic experience. More than 25 technical schools, colleges and universities in the region. The North Central Illinois region offers premier educational opportunities, with exemplary public schools and access to varied higher education opportunities ranging from state-of-the-art technical programs to more than 25 diverse colleges and universities. According to “Cities Rated and Ranked," metro Chicago is ranked number two out of all United States cities based on education system and opportunities. Northwestern University and the University of Chicago are ranked among the top twenty universities in the world. Click on the links provided below for more information on area school districts. The below graph shows education facts on North Central Illinois public high schools. Click on the provided links below for more information about colleges and universities that serve the North Central Illinois area.